Turaco Lodge has just been awarded Unique Luxury Retreat for Mpumalanga, South Africa by Luxury Travel Guide. Turaco Lodge is situated in Marloth Park, which is in Big 5 country. It borders the world-renowned Kruger National Park and is based within a conservancy that has its own free-roaming wildlife. The guest house has just been received the Unique Luxury Retreat for Mpumalanga, South Africa by the Luxury Travel Guide. 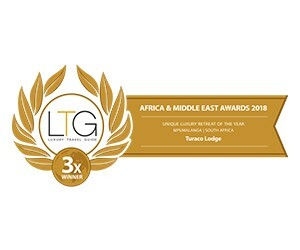 This is the third time they have won this award from LTG which is a very rare and impressive accolade. Turaco Lodge offers luxury accommodation for the discerning traveller and those who want a great bush experience while still having all the comforts of home.They cater for a maximum of 11 guests in 5 rooms, ensuring personal attention. The guest house specialise in tailor-made packages and tours in and around Kruger National Park, including the Panorama Route. Activities available in the area include game drives, bird watching, bush walks, fishing, golf, day visits to Mozambique & Swaziland, night drives in Kruger National Park with Park Rangers. All rooms are air conditioned, with king-size, extra-length beds and fine linen. Every room has a private bathroom with a shower, complimentary amenities, and a hair dryer. The lodge also offers free WiFi. Turaco Lodge boasts a terrace where guests can enjoy a relaxing drink after an exciting day of game viewing. They promise great home-cooked meals that are freshly prepared daily and they cater for most dietary requirements. The guest house offers packed breakfasts on request, too should you wish to self-drive into Kruger Park. Visit http://turacolodge.com/ for more information and reservations, or contact Danielle Hayman on +27 (0) 83 383 6183 / info@turacolodge.com.